Greg and Sandra Milakovich, U.S. contacts for the Arnold-Liebster Foundation, were invited to present a one-hour workshop on the Nazi persecution of Jehovah’s Witnesses as part of the following 7th-12th grade teacher workshop at the Illinois Holocaust Museum and Education Center in Skokie, Illinois. 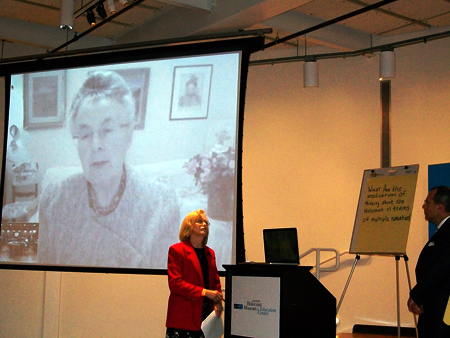 A highlight of the workshop was a live Skype interview with Simone Arnold Liebster from France, who spoke about her experiences as a 12-year old Jehovah’s Witness during the Holocaust. Students are often unaware of the magnitude of the Nazis’ intent and their targeting of other groups for racial, ethnic, and political reasons. Join Dr. Geoffrey Giles, Associate Professor of History from the University of Florida, as he explores and discusses those deemed “undesirable” under the Nazi state.